These delicious Crispy Parmesan Potatoes make the perfect snack or side! My girls love dipping them in sour cream or ketchup! Preheat oven to 450 degrees F and line a pan with parchment paper. 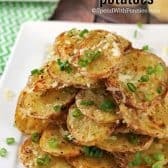 Slice potatoes 1/4" thick and toss with olive oil seasoning and 2 tablespoons of parmesan cheese.